Death Note: Confrontation from IDW Games is an asymmetrical two-player game that lets opponents participate in the cat-and-mouse chase depicted in the anime of the same name (click that link for a short review of the show!) between the enigmatic detective L and Kira, who possesses a notebook within which he can write a name and kill a target. Kira’s goal: Kill as many criminals as possible without being identified by L. L, of course, is attempting to stop the spree before too many fall prey to the mysterious killer. The mechanics of the gameplay themselves are ridiculously simple…but there’s plenty of challenge to the mental gymnastics on both sides of the chase! Whomever is playing Kira will shuffle the Suspect cards and draw one secretly, determining his or her identity and Local Area on the map in the black notebook. The rest of the Suspect cards then become a draw pile for the person playing L.
If both players select a different crime scene, then Kira wins the Chase phase and gets “free” points towards their end goal. I say “free,” because the kill represented at the crime scene does not show up on L’s map, meaning he gets no leads! 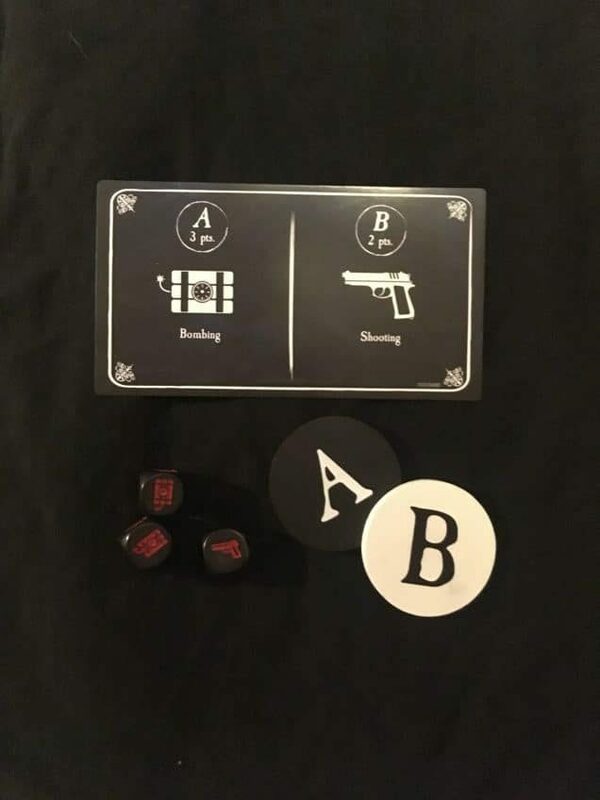 If both players end up at the same crime scene, L wins and gets to draw a card from the Suspect draw pile – eliminating one of the 20 suspects on the map in his white notebook, and Kira scores no points during the Chase phase. Will Kira go for the most points available between the two crime scenes, or will he anticipate that you’re anticipating that he’ll go for the most points and therefore choose the lesser amount of points? The guessing game here is fun! But, man, if one player goes on a streak during this phase, it is really, really tough to recover from what they gain (points for Kira or eliminated Suspects for L). True to the show, L then gets the chance to manipulate the Nightly News. He does this by rolling three 6 sided dice with symbols representing either a stabbing, a shooting, or a bombing. Each of those types of kills are represented on both players’ maps and are numbered. It is up to L to strategically pick which numbered stabbing, shooting, or bombing populates the news because Kira uses the news to select his victims! The strategy in this step is what makes the game in my opinion. L has to use this step wisely to narrow down the 5×5 Local Area within which Kira is operating, thus identifying the killer. Kira must claim one of the killings as his own, thus scoring points…but also giving L some clues as to his whereabouts. Kira has one important rule to follow during this phase: He can only claim 2-3 (depending on which mode you’re playing) kills outside of his 5×5 Local Area during the course of the game. These are called Regional Kills. He must choose them wisely if he’s going to throw L off of his trail! If L calls out three killings and none of them fall within Kira’s Local Area and Kira has already made his 2-3 Regional Kills, then a Quiet Night passes, and if 2-3 (again, depending on the mode) of those pass before L identifies Kira, L loses! L has to carefully eliminate Suspects based on the pattern of killings and any Suspect cards he drew during the Chase phase. If he can correctly identify which Suspect is Kira before Kira racks up a certain number of points, Kira loses! After Kira makes his kill from the evening news or a Quiet Night passes, you return to the Chase phase and rinse and repeat until there is a winner. The deadly notebook Kira has come into possession of belongs to a Shinigami named Ryuk. He is conspicuously absent from what is called Chapter One, or the easier version of play. Chapter Two, however, introduces a new resource for both L and Kira that can be used to varying advantages during play. Kira has opportunities to collect Apples from crime scenes which can be cashed in for favors from Ryuk. Similarly, if L wins the Chase, the Suspect cards feature Stars that can be used to swing things in his favor, as well! The maps for Chapter Two are also populated by over 3x as many numbered crimes (32 vs 112)! This makes L’s job, in particular, that much more difficult during the Nightly News phase! But that difference in difficulty is an appreciated aspect of the game. Chapter One’s lower difficulty is great because it makes the game more accessible to a younger crowd! The strengths of Death Note: Confrontation are the ways by which both players can manipulate information. Kira does his best to create as much of a false narrative as he can to keep L from zeroing in on his identity while L has to make deductions based on the information gained during both phases. 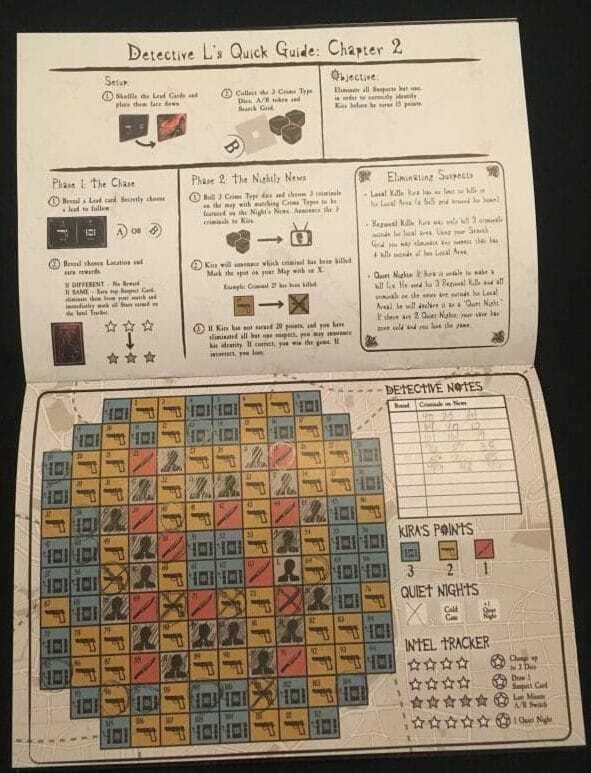 The notebooks each player works out of makes tracking the information a breeze, and each map also has a full page guide to the set up, objective, phases, and rules for the character. The font on the guide can be tough to read, though; particularly in Kira’s notebook…Apart from the squinting, the notebooks are awesome components! Out of the box, you can play each Chapter (read: difficulty) 11 times. I generally dislike that as a design characteristic unless there is an easy way to snag replacements for the “spent” components. I mean, I suppose you could use pencil and just erase if you wished…or make photocopies ahead of time? 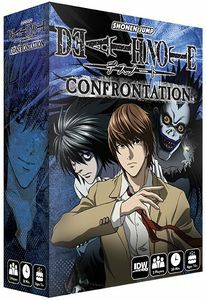 Bottom line is this: Death Note: Confrontation sets up in literally no time, is extremely simple to teach, and does a great job of translating the intellectual battle between the two characters from the anime into gameplay. You don’t have to be familiar with the IP at all to enjoy that mental showdown in the game! All of that is a major credit to Jordan and Mandy Goddard, the game designers. 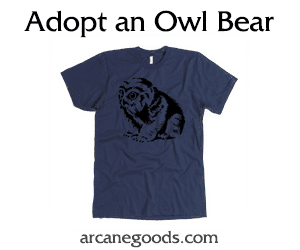 You can grab a copy from Amazon or, better yet, look for it at your FLGS.